Does Teeth Whitening Damage Them? Teeth whitening has spilled into the mainstream for good reason: it works and it does not drain your savings. For all the good teeth whitening does, there is the slight potential for a little bit of bad. Below, we examine the minor risks of whitening the teeth. In general, teeth whitening does not pose a threat to the teeth. However, some patients take the DIY (do it yourself) route and attempt to whiten their own chompers at home with an over-the-counter product obtained at a local store. The improper application of whitening agents to the teeth has the potential to damage surrounding gums as well as the teeth. The bleaching agent must be strictly limited to contact with the teeth. Furthermore, it should be applied in specific amounts at exact frequencies. For the most part, patients who follow the directions on the teeth whitening solution will not experience any damage or pain. What About Teeth Whitening Toothpastes? Whitening toothpaste relies on chemical agents to eliminate surface stains. There is no use of bleach. However, there are some shady teeth whitening toothpaste on the market. If the product in question does not have the ADA (American Dental Association) Seal of Acceptance, you should not purchase it. This seal indicates the toothpaste meets the standards for effectiveness and safety as defined by the ADA. Those who have crowns, fillings and additional dental work should not start whitening their teeth until consulting with a dentist. There is the potential for the bleaching agent in teeth whitening solutions to damage such restorations. Consult with your dentist to craft a treatment plan that will accomplish the results you envision in your mind's eye. Do not lose sight of the fact that the ADA advises the use of teeth whitening products only under the supervision of an experienced dentist. These products are not regulated by the Food and Drug Administration (FDA) in any way. There is the potential for teeth whitening products to spur tooth sensitivity. However, this sensitivity is not permanent. It will dissipate fairly quickly after the teeth whitening solution is applied. Avoid uber-hot and cold beverages along with salty and sweet foods in the immediate aftermath following treatment to prevent nerve tissue irritation. What About Potential Damage to Tooth Enamel? Damage to tooth enamel is by far the leading concern when it comes to teeth whitening solutions. An analysis of the research shows results are mixed as to whether teeth whitening damages tooth enamel. If the hydrogen peroxide within the whitening solution is at an especially high concentration, it can lead to a wearing of the tooth enamel surface. In the vast majority of cases, teeth whitening does not damage tooth enamel. Enamel is by far the hardest surface in the entire human body. When in doubt, ask Ping Hai DDS! 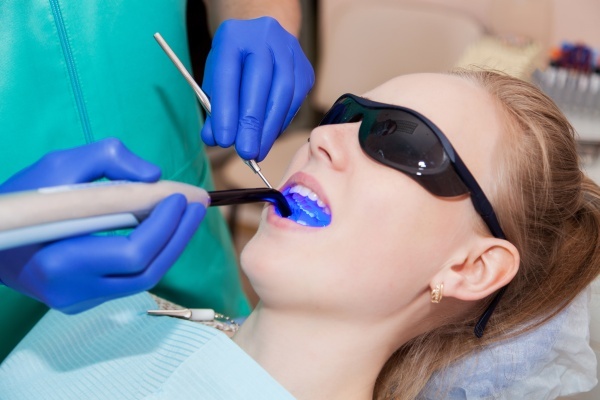 We will help you select the best and safest teeth whitening treatment for your teeth. Call us today at (770) 239-2722!